A Veere Di Wedding Photobomber. Kareena Kapoor, Is That Any Way To Behave? Kareena Kapoor had flown into Phuket sometime over the weekend to film the remaining parts of Veere Di Wedding and now, it's a wrap on the Phuket schedule. The other veeres - Sonam Kapoor, Swara Bhaskar and Shikha Talsania - surely must have been thrilled to have Kareena join the sets but will they know Kareena loves to photobomb their photos? 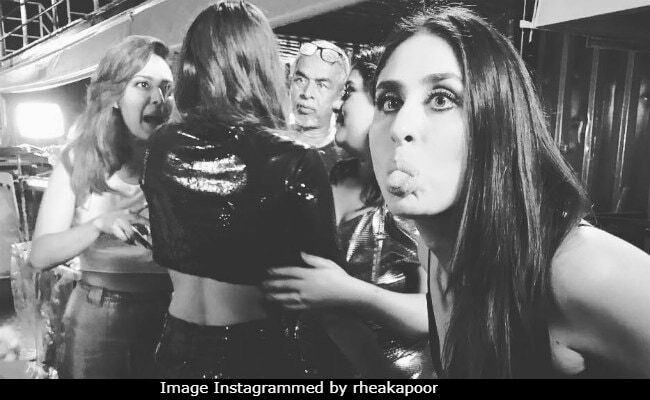 In an update shared on producer Rhea Kapoor's Instagram, Sonam, Swara, Shikha and the film's director Shashanka Ghosh have been hilariously photobombed by Kareena. It appears Kareena entered the frame just in time for a stick-out-tongue expression and we'll give it 10 on 10 on the quirk metre. Sonam's sister Rhea was in no mood to discard and used it up to announce: "Almost at the finish line!!!! That's a wrap on Phuket! @vdwthefilm see you MAY 18! (sic)"
Almost at the finish line!!!! That's a wrap on Phuket! @vdwthefilm see you MAY 18! Kareena Kapoor is actually an expert at making funny faces - and here's proof in another Veere Di Wedding moment. Veere Di Wedding is much anticipated because it's Kareena's first movie after Taimur was born last December. Kareena, known for being the fitness freak she is, shed the post pregnancy weight with a strict work-out regime to begin shooting for the film soonest. The Veere Di Wedding team arrived in Phuket last week and shared jealousy inducing photos from the beautiful shoot location. Here are a couple. @sonamkapoor making #kitesandballoons fly @amanpuri this morning! When u are dog tired after a looooooong flight.. actually two.. but still gotta chill out with your #Veere At @amanpuri #Phuket with @sonamkapoor @rheakapoor @shikhatalsania #VeereJustWannaChill missing #kareenakapoorkhan #VeereInThailand also yeah.. upside down video whatever!!! Team Veere Di Wedding wrapped the lengthy first leg of the shooting in the National Capital and the dispersed ahead of Diwali. After a brief break, they were back on sets in Phuket. The wait for Veere Di Wedding will be over on May 18, 2018.